Start By the station approach to South Godstone railway station. Parking on road around the village. Comment An interesting and varied walk in countryside typical of this area. There are many stiles and in a lowlying area you should be prepared for some mud and boggy patches after periods of rain. With the former pub, now The Lagham bar and restaurant on your right, and the station vehicle entrance on your left, walk uphill a few paces to a gap in a brickwall on your left by a bus stop. Go through this gap and ahead through new housing in St. Stephen’s Court. Keep straight on. To the side of the last house is a footpath. Walk on along this, by the side of the railway, until it emerges onto a road. Turn uphill on the road for ¼ mile taking great care. Pass Stansted House on your right. Look out for a drive on the left by a lodge, just before open fields. Turn left down the drive and, almost immediately, right, by a hut, and over a stile into a field. Bear right up the field to a second stile and cross into a further field. Keep on to the top corner (might be very wet). In the top corner bear right over a stile and footbridge into an enclosed path. At the end of this path, cross a stile and bear right, along the wire fence on your right, passing farm buildings, to reach a stile in front of a wood. Cross onto an asphalt path and turn left to follow the edge of the wood to its end by a metal fieldgate on your right. Here, by a dark evergreen bush, is a stile. Cross into a field and go diagonally left, across the field, to trees and a fence at the far side. Cross a stile onto a track. Turn right and in a few paces reach a stile on your left. Cross this into a large field. Cross the field (may be wet) bearing slightly right, to a strange combined footbridge and stile at the far side. Cross to a road and turn right uphill for some way. 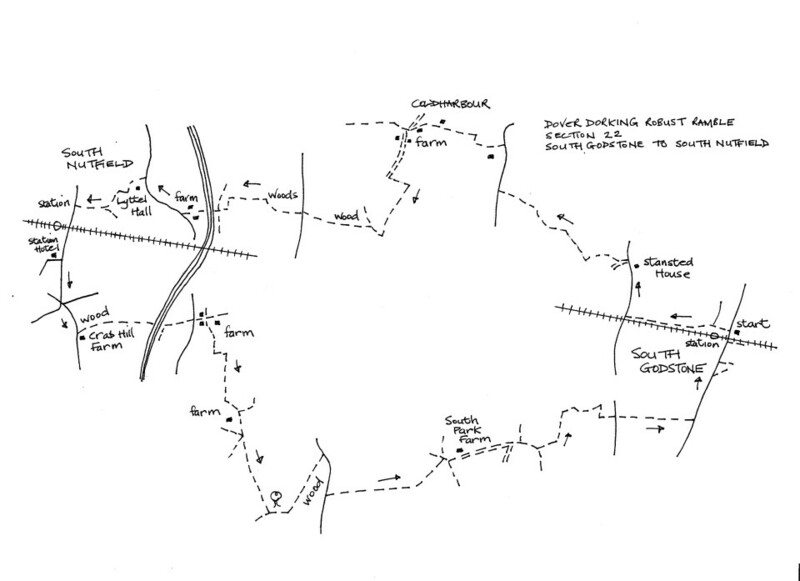 Just past a house set back on your left, turn left into a field on a path which is part of the Greensand Way (GW). Follow this broad track down then to the right, then to the left, then uphill by a wood. Pass a house on your right and soon reach a vehicle drive at a house called Coldharbour. Go ahead on this roadway to a junction of ways. Turn left downhill, still on the roadway, and wind through converted farm buildings to the very bottom. Go ahead into a field and walk downhill with the hedge on your left. Where the ground begins to level out, by a tall tree, come to a corner of the hedge. Go left through a gap into a field on your left and continue on with a hedge still on your left. At a corner, cross a stile and turn right to walk down a field with a hedge on the right. Keep on over a stile and footbridge, and on to a further stile. Cross this to a farm drive. Turn right on this drive (a bridleway) and stay on it (ignore a path going off right into a wood) for ½ mile (can be wet in parts) to a road. Cross the road to a stile into a field and keep straight on to a stile by an old metal fieldgate. Keep ahead, over a stile into a second field then on to a further stile by a metal fieldgate and corner of woodland. Cross and follow the edge of the wood, around to the right to a fieldgate. Turn left here along the wire fence to a stile in the corner (there is traffic noise from the M23). Cross the stile and keep on, still along the fence line. At the end of the field, bear left for a few metres, then right, over a stile by a fieldgate. Go up the field by the hedge on your right to a stile at the top. Cross and bear left on a concrete track, under the M23. keep on through farm buildings, to a road. Turn right up the road for some way with care. Look for a path on your left just past Lyttel Hall. Cross a stile into a field and go diagonally downhill on a feint path (excellent views) to the far corner. Cross a stile and go downhill by a hedge to another stile in a very wet corner. Cross this stile and a footbridge, and follow the hedge on your left, round to another stile. Over this, bear right, along the hedgeline, to a final stile by a fieldgate onto a driveway. Go forward to a main road. Turn left to soon pass North Station Approach Road and shops by South Nutfield Station. Keep on downhill and under the railway bridge to reach the Station Pub on your right and the end of the section.